Gold Coast Real Estate Specialists – Runaway Bay, Paradise Point, Hollywell, Biggera Waters, Surfers Paradise, Coombabah, Helensvale, Hope Island, Coomera, Labrador, Southport, Arundel. GC Real Estate specialises in residential property management and sales in the northern the Gold Coast and is prominently located in Runaway Bay with quick and easy access to all suburbs. As members of the Real Estate Institute of Queensland (REIQ) and an accredited REIQ agency, you have the assurance of knowing that GC Real Estate is committed to upholding the REIQ Standards of Business Practice. We have valued clients located across Australia and around the world. 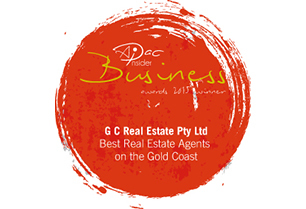 We were proud to be named a winner in the 2015 APAC Insider Business Awards for best Real Estate Agents on the Gold Coast. At GC Real Estate our proven sales results come from experience, knowledge, dedication and commitment. If you are looking for a unique service experience, then look no further. Looking after your property is our first priority and we guarantee to keep you informed every step of the way. Contact Mario or Jenny today to find out what we can do for you or visit our property management page for more information. We look forward to talking to you – so call today.